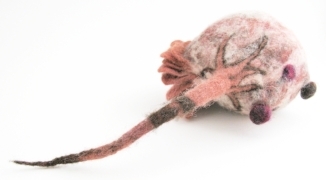 The lovely Kate Barsotti of pencilandsheep.com wrote Needle Felting: From Factory to Gallery for TextileArtist.org. It's an intriguing and humorous look at the history of felting, the differences between wet-felting and 'dry'-felting schools and includes work & interviews from Stephanie Metz, Zoe Williams and myself. At the very beginning of my felting career, I did a lot of research on the folks that were making wool sculptures. Immediately, I was struck by Zoe's consistent imagery and technical prowess, as well as her ability to combine wool effortlessly with clay and bead components. Stephanie's work blew me away with her realistic sculptural capabilities and abstracted organic shapes. (To be honest, the first time I saw Stephanie's Amorphozoa series, I considered quitting feltwork... it was if she had peered into my brain and made everything I hadn't even dreamed up yet.) So inspired by these two artists, I had an unspoken goal to one day be in their company. How sweet to end the year having my work featured with theirs! 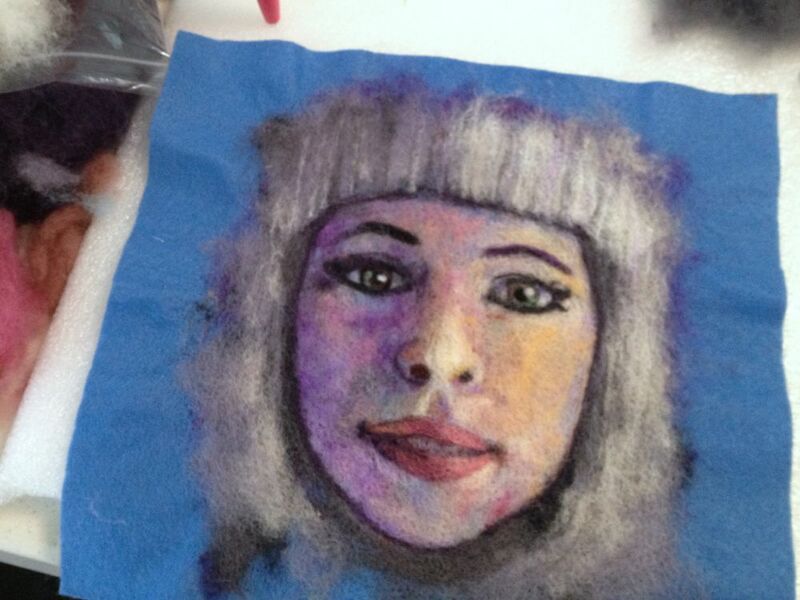 How did I come to needle-felting? What do I love about the medium? What do I hate about it? What advice would I give folks starting out? Ok, it's a very nice spread with lots of pictures and me blathering on about why I do what I do. Please go take a peek. 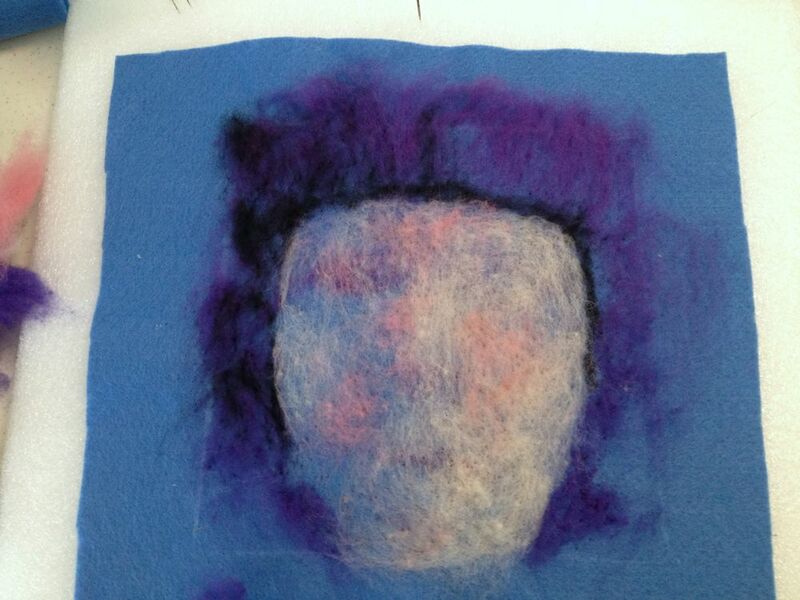 "Painting with wool" is a phrase you'll see often when it comes to flat feltwork. There is a very painterly aspect to it, and in some ways it's even better than paint because the wool never dries. Placing color without commitment or pulling it up allows for a lot of creative freedom. This blog post isn't about composition, color or content. It's all about planning, preparing, felting (wet, needle & machine), and presenting your artwork for a finished, polished product. So let's start where most people finish: the frame! Why do this? Flat felt often looks best when it's FLAT. Even if you have 3D elements included (see "Rise to Raise") the cleanest image will not have wrinkles. Framing also lets you hide all those fuzzy edges. Here is an 8" x 8" frame. I've taken out the plexiglass (which I don't intend to use in my finished piece) and I'm using it to measure out how much acrylic craft felt to use. Hint: Using plain old craft felt reduces shrinkage and keeps the image from being skewed while it's being worked. For this piece, I'm adding approximately 1/2" to my total width and marking it with tailor's chalk. Taping off the edge isn't a great idea, since the tape will pull all sorts of fiber out with it later. A little there....start needle-felting the layers, adding colors and moving shapes as needed. Yes, I know I skipped ahead! And yes, I know that's felting-phenom Zoe Williams! At this point, all my color is on. I have checked my image size against the frame and it's all good. You could stop here, but I take it to my trusty felting-machine. A felting machine is nothing more than 5 needles and a pedal for speed. It only goes up & down, so you will not get any nuance, which is why I use it after I'm sure there is nothing more I want to add to the piece. It pushes the wool through the acrylic felt VERY VERY fast, so you really have to pay attention. Otherwise your image might be punched through to the back in no time. Close up of the machine-felting. The right side has been worked well after just one pass. The left side looks very fluffy still. So why use the machine at all? It's an enormous time saver. Thousands of uniform pokes in a matter of minutes. Of course you could stop here, but the machine has left a very distinct uniform poked pattern and so I take it even further and wet-felt to get rid of all those holes. Wet-felt with olive oil soap gel. Shana's hint: make your own soap gel. It's easy! You might get a little more shrinkage, believe it or not. Rinse with hot water then cold water. Gently roll it up in a towel & squeeze. Then let it air dry overnight. Close-up of the needle-machine-wet-felted image. So smooooooooooth! Adhesive backed foam-core is your friend! Cut a piece just slightly smaller than the plexiglass, since your felt will wrap around it and add to the dimension. Rusty razor blades are not your friend. 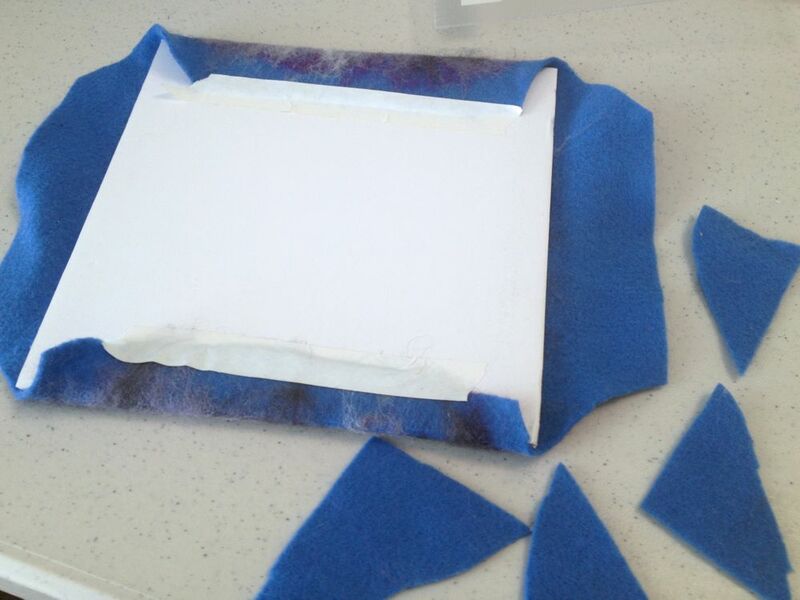 Shana's hint: When cutting foam-core, make a shallow cut first to 'break' the paper skin, then go deeper. Remember to always use a cutting mat underneath and a clean sharp blade for best results. Felt on adhesive backed foam-core is forgiving, so don't worry if you don't get it placed correctly right away. When it looks right, check it in the frame to make sure the placement is exactly where you want it before you press hard & start taping the edges down. Tape 2 edges down with artist's tape. Masking tape will work, too. Avoid duct tape, scotch tape, double-sided tape, and the like. I have a tape fetish, but that's for another post. 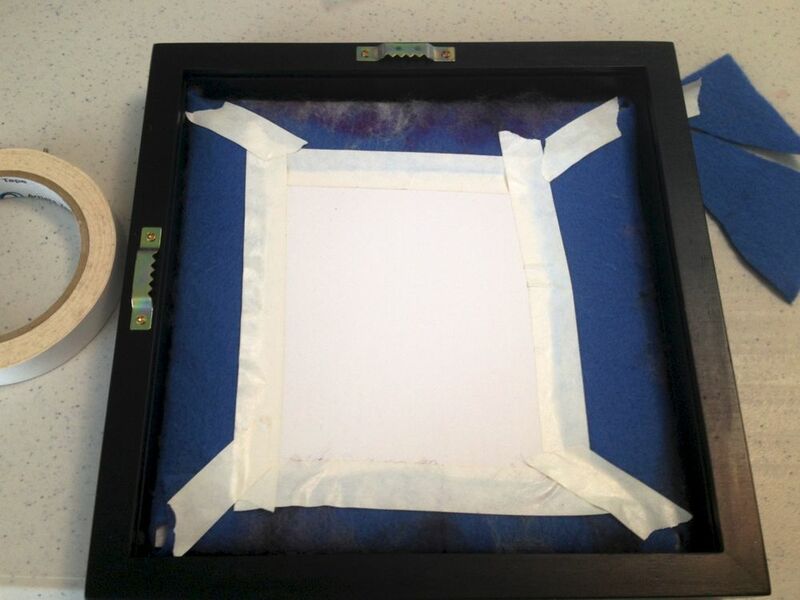 Unless you're really good at making hospital bed corners, or origami swans, you're probably going to want to cut off the corners to make the foamcored-felt fit in your frame. And yes, you could cut them off before you tape the first two edges but I want to make sure I'm not removing any material that might leave a hole in the front. Tape all around. 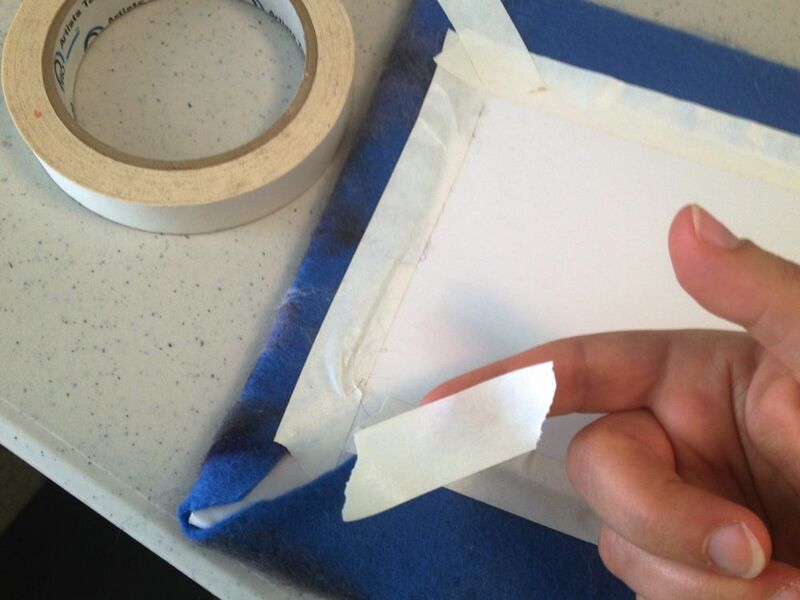 Shana's hint: Putting the tape on the felt first and stretching it to the foam core will give you more control. Shana's secret power: Every time I tear a small piece of tape, it looks like the state of Tennessee. Pop it in the frame, add the frame back and VOILA!! A clean professional finish to your felted artwork! I hope this was useful. You may also enjoy my post on 12 Inexpensive Felting Studio Tools. If you have thoughts on more step-by-step tutorials you'd like to see me cover, please let me know. And if you like this blog, please add it to your reader and/or sign up for my seasonal newsletter here. I regularly find myself on the look-out for items that can be used in the studio, that aren't necessarily intended for studio use. While I don't mind spending more on quality materials, sometimes my most useful tools came to me free or for under $10. 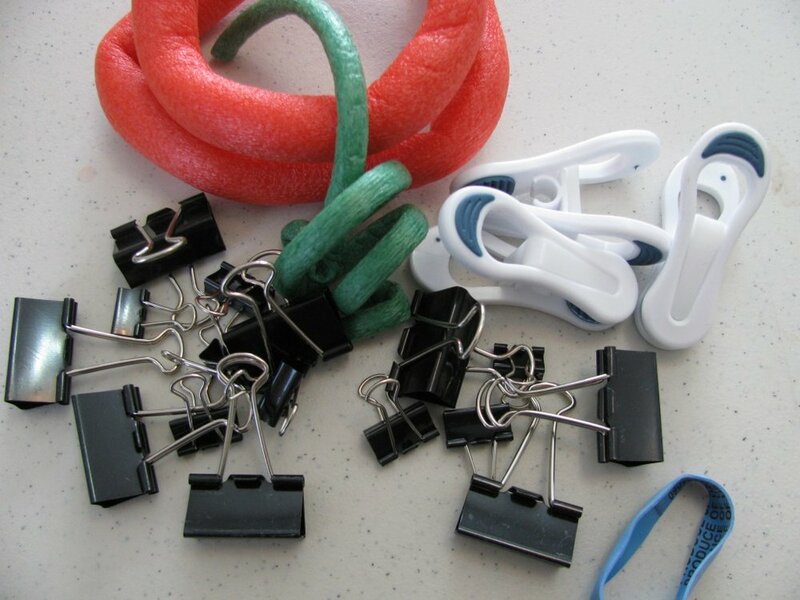 Thrift stores, discount stores, hardware stores and yard sales are often a treasure trove of ideas. For agitation, I was tickled to find this pet food tray. Not only is it a great surface for wet felting smaller objects, but it can be used as a washboard. Same with the soap dish (Thank you, Dollar Store!). It bends easy to go around smooth rounded surfaces. The exercise ball is heavier than it looks. I use it for fulling only. I don't often need to blend my own colored wool, so spending $60-$100 on carders simply didn't make sense. So, when I saw these grooming brushes at my local pet store for $4 a piece, I couldn't resist. Perfect for rolags and small batches. The pink shiny fingerguards have saved my little fingertips more often than I'd like to admit. I've only seen them offered by FiberInfusion on Etsy. Eyebrow & bikini razors are fabulous for shaving finished pieces. One of my favorite "cheap" tools is this salad spinner from a store that rhymes with Shmig Shmots. For quick drying pre-felts or smaller objects that simply won't towel dry easily. The shelf liner is ribbed and make for a great alternative to bubble wrap. I can't tell you how often I use tulle in my practice. It's great for laying out delicate designs. It's great bundled up as a 'scrubber', although it creates a lot of soap foam. Most importantly, its fabulous for blocking (shaping wet wool.) 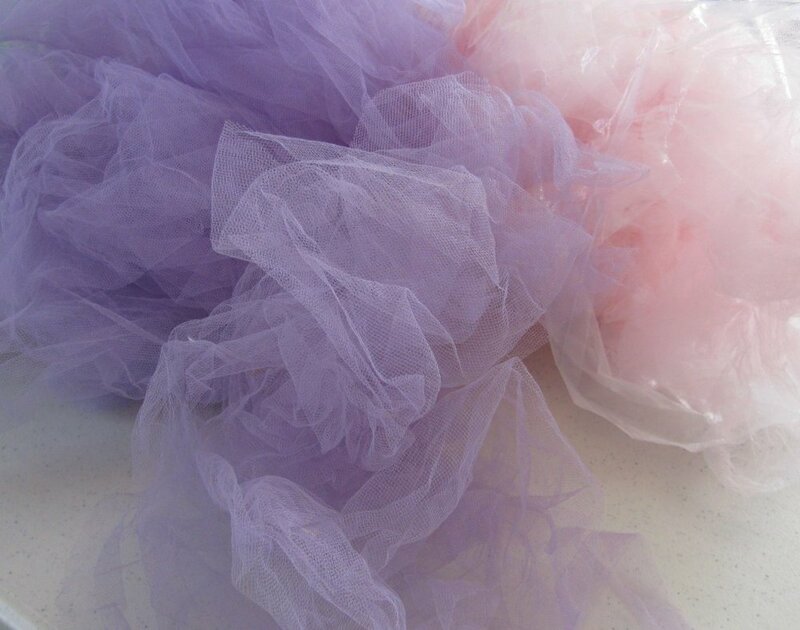 A friend of mine gave me oodles of tulle leftover from her fabric stores. The smaller the weave the better, but even the larger stiffer tulle can be useful in stuffing & shaping a vessel. Speaking of shaping, binder clips are a great tool for creasing/pinching felt. I have them in all sizes. Foam-covered wire comes in handy for stabilizing and hanging wet felt. Some are from New England Felting Supply & some from a leftover kid's toy called Toobers & Zots. Workspace ergonomics is essential for good studio health. I grabbed some inexpensive PVC pipe and a hacksaw to raise my wet table to a comfortable height. And the padded flooring was the best $15 investment! Before finding it in my price range (Costco), a doubled-up yoga mat worked well for standing on for long periods. I think that was more than twelve, but I hope this has been helpful for both newbies and experienced felters & crafters alike. Did I miss anything? What are your favorite non-traditional tools? Please share! If you're anything like me, you've got bins and bags and more bins of wool. Keeping track of which wool came from which supplier is nearly impossible, so when I got my huge (80!!) sample box of colors from Opulent Fibers I figured I should get control of the situation, pronto! Here's my solution: Business card pages and a 59 cent binder. Just pinch off a piece of your wool roving/batt, tuck in the pocket and transfer the sticker. OR write on the pocket with a sharpie if there's no sticker. Easy and cheap!! Now to get back to organizing my oodles of woolies. It's gonna be a long day.